Received June 20, 2018; Revised August 6, 2018; Accepted August 17, 2018. There is currently debate if brachio-basilic vein fistula (BBVF) should be performed as a one-stage or two-stage procedure. The aim of the present study was to perform a systematic review and meta-analysis on BBVF staging. On February 25, 2016, a search for randomized-controlled trials (RCTs) on BBVF procedures was performed in MEDLINE and Scopus databases. Meta-analyses were performed with fixed-effect or random-effects models as appropriate with risk ratios (RRs). The primary efficacy and safety outcome measures were BBVF maturation and development of complications, respectively. Specific types of complications, including loss of functional secondary patency and long-term complications were all secondary outcome measures. We identified three RCTs reporting on 126 patients. Maturation failure of two-stage BBVFs (3/47, 6.4%) was less frequent than one-stage BBVFs (16/79, 20.3%; RR, 0.27; P=0.02). Complication rates of two-stage and one-stage BBVFs were similar (RR, 0.80; P=0.54), but on sensitivity analysis these were less likely to occur with two-stage BBVFs (37% vs. 69% for one-stage BBVFs; RR, 0.57; P=0.03). Two-stage BBVFs were less likely to lose their functional secondary patency (21.3% vs. 31.6% for one-stage BBVFs; RR, 0.61; P=0.11). This non-significant trend became significant (RR, 0.36; P=0.02) on sensitivity analysis. There was no difference in specific complication rates of the two study groups. Among candidates for BBVF fistula, there is evidence to suggest that two-stage BBVFs achieve higher maturation rates compared to one-stage BBVFs. The evidence for difference in long-term secondary patency is less robust, calling for further research. Vascular access guidelines recommend that brachio-basilic vein fistula (BBVF) , should be the third access option for hemodialysis, after radio-cephalic and brachio-cephalic arteriovenous fistulas (AVFs). Because they have better patency and lower infection rates than prosthetic grafts, BBVFs should be preferred over prosthetic grafts in patients with no cephalic vein options [2,3]. BBVF involves mobilization, superficialization and anastomosis of the basilic vein with the brachial artery. Originally BBVF was described as a one-stage (primary) procedure, with superficialization being performed with transposition (rerouting) of the basilic vein , or alternatively elevation within the incision . Two decades ago staging of BBVF was introduced , with a brachio-basilic AVF being performed during the first stage followed by superficialization during the second stage after a period of several weeks, again in the form of transposition , or elevation . Two-stage procedures have several advantages . First, interval arterialization makes staged transposition easier, because the basilic vein is enlarged (typically between 6–10 mm) . Second, interval arterialization makes staged transposition safer by possibly increasing usage rate, because a small (e.g., <4–5 mm) and thin-walled basilic vein superficialized in a one-stage procedure may fail. Third, interval arterialization elongates the basilic vein providing more length for cannulation. Fourth, in case steal syndrome or venous hypertension develops after staged procedures these complications can be managed before the transposition is performed. These advantages should be balanced against the inherent delay in staged BBVF. At present there is some evidence to support staged BBVF; a single-centre randomized-controlled trial (RCT) reported improved maturation rates with procedure staging compared to primary procedures , although it had several faults, including the absence of preoperative vessel mapping since the study was performed before this technique was first reported. A much smaller study reported similar results . The equivalent results of case-control studies [9,10], suggest that staging might not be necessary, however these findings could be the result of bias as primary procedures are performed in patients with basilic veins enlarged by the presence of previous more proximal AVFs and staged procedures are usually performed in patients with basilic veins of smaller diameter (e.g., <4–5 mm). The aim of the present study was to perform a systematic review of the literature and meta-analysis, including only RCTs comparing one-stage with two-stage BBVFs, to avoid the inherent bias of case-controlled trials. BBVF maturation was the primary efficacy outcome of our study and complication rate the primary safety outcome. On February 25th, 2016, we conducted a literature search on MEDLINE and Scopus electronic databases using the key-words ‘basilic or brachio-basilic’ with no date limit, in order to identify RCTs comparing one-stage with two-stage BBVF, followed by a manual search of the reference list of the full-text articles to identify additional trials. Studies published in languages other than English were not considered, and unpublished data (e.g., from the authors of the included studies) were not sought. RCTs were identified by two of the authors (SKK & GCL) and any disagreement was resolved by discussion. The study selection process was outlined using a PRISMA flow-diagram. For each RCT included in the study, raw data (number of patients who developed an end-point and total number of patients in the intervention and control groups) were independently extracted by two of the authors (SKK & GCL) and entered into datasheets. All entries were compared, any disagreement was resolved by discussion and once confirmed they were entered into the meta-analysis software. Maturation failure (including early thrombosis with no time frames, i.e., overall maturation failure, was defined as inability to use the BBVF for hemodialysis) was the primary efficacy outcome measure and all complications the primary safety outcome measure. Early postoperative thrombosis, wound infection, any wound complication, steal syndrome, venous hypertension, aneurysm formation, hematoma, functional secondary patency (BBVF abandoned due to long-term failure, including early failures), loss of functional secondary patency excluding early failures, and finally any long-term complication were all secondary outcome measures. BBVFs that thrombosed before the second stage were included in the analysis on an intention to treat approach. The risk of bias assessment tool provided by the Review Manager Software (ver. 5.3; The Cochrane Collaboration, Copenhagen, Denmark) was used to assess the methodological quality of the trials. An independent assessment was performed by two of the authors (SKK and GCL) and any disagreement was resolved by discussion. Meta-analysis was performed with Review Manager which calculated the risk ratio (RR, Mantel-Haenszel method) and its 95% confidence interval (CI), produced forest plots and provided inconsistency (I2) statistics to evaluate the heterogeneity of the included studies. A non-significant P-value for the Cochrane Q statistic indicates that the included studies are homogeneous. An I2 value of 0% indicates no heterogeneity, while larger values are consistent with increasing heterogeneity. An I2 over 50% is indicative of substantial heterogeneity. In case of statistically significant heterogeneity (P≤0.05) a random effects model was chosen, instead of the fixed effect model. Sensitivity analysis was performed in order to address possible issues introduced by pooling of trials with variable methodological quality and surgical techniques, therefore the analyses were repeated by excluding trials with a high risk of bias or significant variations of the surgical techniques as justified by the authors. The system developed by the Grading of Recommendation, Assessment, Development and Evaluation (GRADE) working group was used to grade the quality of evidence as high, moderate, low and very low, based on risk of bias, directness of evidence, heterogeneity, precision of effects estimates, and risk of publication bias. A ‘summary of findings’ table was created using GRADEprofiler (ver. 3.6; Mc-Master University and Evidence Prime Inc., Hamilton, ON, Canada), which included the two primary and all secondary outcome measures. The assumed control intervention risks were calculated from the mean number of events in the control groups of the included studies for each outcome. After removing the duplicates, we identified 900 records on literature search (PRISMA flow-diagram, Fig. 1). Some 893 of them were excluded based on their title and abstract, and an additional four records because they were case-control studies (n=3) or a letter to the Editor, which left three RCTs into the study [7,8,11]; their characteristics and key findings are outlined in Table 1. Risk of bias and summary graphs are shown in Fig. 2. 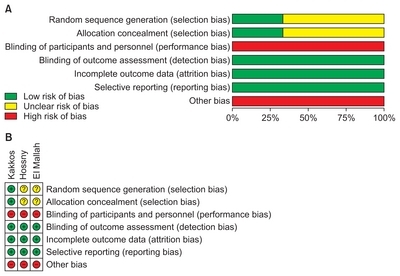 These demonstrated a low risk of bias in most attributes; however random sequence generation bias and allocation concealment were low only in one trial , and risk for performance bias was high for all trials. Blinding of outcome assessment (detection bias) was considered as being low for all trials because typically assessment is performed by the nephrology team and not the operating surgeon. Incomplete outcome data (attrition bias) were not reported for this patient population undergoing assessment for study outcomes three times a week during hemodialysis sessions. Other bias in the form of cross-over of patients was noted in one trial , early stop in another one , and the performance of procedure variations was noted in two trials (Table 1) [7,11]. All three trials were eligible for quantitative meta-analysis. Maturation failure of one-stage BBVFs (16/79, 20.3%) was significantly worse compared with two-stage procedures (3/47, 6.4%; RR, 0.27; 95% CI, 0.10–0.78; P=0.02, fixed effect model, Fig. 3A), with no heterogeneity. 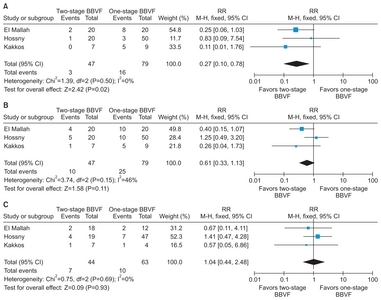 Complication rates of two-stage and one-stage BBVFs were similar (RR, 0.80; 95% CI, 0.40–1.61; P=0.54, Table 2). Regarding secondary outcomes, all maturation failures were reported to be the result of thrombosis, apart from one BBVF (15/79, 19% for one-stage BBVFs vs. 3/47, 6.4% for two-stage BBVFs; RR, 0.29; 95% CI, 0.10–0.84; P=0.02, fixed effect model), with no heterogeneity (I2=0%). On long-term outcome assessment, there was a non-significant trend for two-stage BBVF procedures losing their functional secondary patency less often (21.3% vs. 31.6% for one-stage procedures; RR, 0.61; 95% CI, 0.33–1.13; P=0.11, fixed effect model, Fig. 3B), without significant heterogeneity being present. After excluding early maturation failures, long-term failure of one-stage BBVFs was similar with two-stage BBVF procedures (RR, 1.04; 95% CI, 0.44–2.48; P=0.93, fixed effect model), with no heterogeneity (Fig. 3C). There was no difference in risk for wound infection, all wound complications, steal syndrome, venous hypertension, aneurysm, hematoma formation, and all long-term complications between the two groups (Table 2). For the purposes of the sensitivity analysis were excluded one trial with three accounts of a high risk of bias , and meta-analysis was repeated. Maturation failure of one-stage BBVFs was significantly inferior compared to two-stage BBVF procedures (7.4% vs. 44.8% for one-stage procedures; RR, 0.20; 95% CI, 0.05–0.70; P=0.01, fixed effect model, Fig. 4A). On long-term follow-up, two-stage BBVF procedures were less likely than one-stage BBVF procedures to lose their functional secondary patency (18.5% vs. 51.7%; RR, 0.36; 95% CI, 0.15–0.85; P=0.02, fixed effect model, Fig. 4B). Heterogeneity was not present in both comparisons. Long-term complications, excluding postoperative events, showed a non-significant trend to occur more often with one-stage BBVFs than two-stage BBVFs (4/25, 16% vs. 6/16, 17.5%; RR, 0.42; 95% CI, 0.13–1.37; P=0.12, I2=6%, P=0.30, fixed effect model, Fig. 4C). However total complications were less likely to occur with two-stage BBVF procedures than one-stage BBVF procedures (37% vs. 69%; RR, 0.57; 95% CI, 0.35–0.95; P=0.03, random effects model, Fig. 4D). A detailed assessment of all study outcomes appears in Table 3. The early outcome of maturation failure was downgraded because of risk of bias and upgraded first because of the large magnitude of effect and second because two-stage BBVF procedures were more often elevations than one-stage BBVF procedures, leading to a reduced effect size (elevated BBVFs may have worse outcome than transposed BBVFs because cannulation may be hindered by the overlying scar). The outcome of all complications was downgraded because of inconsistency and impression and upgraded because of two-stage BBVF procedures were more often elevations than one-stage BBVF procedures, as explained above. There was high quality evidence for BBVF maturation and moderate quality evidence for the outcome of ‘all complications’, the main outcome measures of our meta-analysis. High quality evidence was also found for early postoperative thrombosis, an outcome very similar to BBVF maturation. The rest of the outcomes, including long-term secondary patency, were graded as having either high or moderate quality, based on explanations provided in the footnote of Table 3. Our meta-analysis has demonstrated that the risk of maturation failure of two-stage BBVFs was significantly reduced compared with one-stage procedures, evidence that was graded as being of high quality. This difference persisted during long-term outcome, an approximately 10% difference that was not significant, although it did so on sensitivity analysis. We decided to include only RCTs in our meta-analysis to avoid bias related to selective use of the two-stage procedure in small basilic veins (e.g., <4–5 mm), which is nowadays a widespread practice [12,13], including in those patients not yet on hemodialysis having smaller basilic veins not enlarged by previous AVFs . Indeed patients with the anatomical variation where the cephalic vein at the level of the antecubital fossa drains into the basilic vein [15–17], get significant enlargement of the latter after a functioning radio-cephalic AVF is created, at a median diameter of 7.1 mm (range, 4.5–9.2 mm) in one study , and future BBVF staging is not required under those circumstances. Our meta-analysis has demonstrated that maturation rates after one-stage procedures are significantly worse than those of staged procedures. In the absence of previous arterialization, the basilic vein can be particularly thin-walled and friable, susceptible to injury during one-stage procedures. Also, the basilic vein may be twisted or compressed by hematoma in the tunnel leading to thrombosis more often in one-stage procedures than in two-stage procedures , as a result of manipulating a small (e.g., <4–5 mm) and thin-walled basilic vein. The maturation advantage of two-stage BBVFs is almost exclusively the result of reduced risk for post-operative basilic vein thrombosis, as clearly shown by our results and also a similar meta-analysis . Our results, based on high quality evidence according to the GRADE methodology, raise the level of evidence from level B to level A because two RCTs have consistent results . There was no difference regarding the individual risk for each non-thrombotic BBVF complication, all long-term complications and all complications between the two groups. However, on sensitivity analysis, long-term complications showed a non-significant trend to occur more often with one-stage BBVFs and all complications were significantly more likely to occur after one-stage BBVF procedures, also indicating that additional research may be warranted. The small risk of the various non-thrombotic BBVF complications, as clearly shown in Table 3, rendered the studies underpowered, indicating the uncertainty without further research being performed. Quality assessment of the present meta-analysis that included only RCTs revealed moderate or high evidence for all outcomes. Interestingly, there was high quality evidence for the outcomes of maturation, early thrombosis and long-term loss of functional secondary patency, while for the outcomes of all complications and all long-term complications the evidence was moderate. This downgrade of the quality of evidence was the result of serious imprecision and inconsistency, indicating that further research may be required. Delay to hemodialysis is an apparent disadvantage of staged procedures , but given the importance of achieving the goal of BBVF maturation, it seems obvious that the large outcome advantage with staged procedures (RR, 0.27; for non-maturation, absolute risk reduction of about 13.8%) outweighs the relatively short inherent delay and its attendant risks, taking into account a 10.1% 50-day infection rate of a hemodialysis catheter if present , and a 11.0% three-year infection rate of a prosthetic graft , should such an option is opted instead of a staged BBVF for a small basilic vein (e.g., <4–5 mm). Included in this meta-analysis, only one trial included the exact time to hemo-dialysis , which was a median of 97 days for two-stage procedures and 54 days for one-stage procedures (P=0.16), a difference corresponding to the six-week delay between the two stages set by the protocol of the study. The other two trials we have assessed did not provide results on time to BBVF use; however, the time interval between the two stages was two and four weeks, respectively [7,11]. It is expected that this relatively short delay would be a minimal impact on time to hemodialysis. 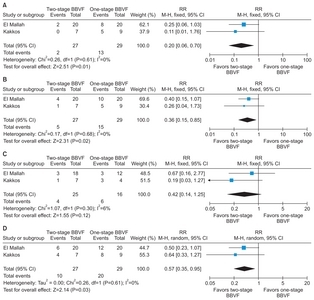 Meta-analyses comparing one-stage and two-stage BBVFs are scarce [19,23,24]. One of these studies, which included mainly case-controlled studies and only one RCT, suggested that the two-stage technique was better than one-stage BBVFs based on a non-significant trend for better maturation and patency results , but the other two meta-analyses resulted in equivalent results, due to heterogeneity and other bias inserted with the inclusion of case-controlled trials, where one-stage is usually performed for enlarged basilic veins. Our meta-analysis has some limitations; the second procedure of staged operations in two RCTs was a simple elevation procedure, while in one of them superficialization was also performed as a primary procedure in one group of patients . This second RCT had some crossovers that could have introduced some bias since an intention to treat approach was not used to report the results. Other sources of bias demonstrated in our meta-analysis, i.e., random sequence generation, allocation concealment and blinding of personnel, might have also influenced the results and this hold particularly true for the latter source. For example in primary procedures the basilic vein can be trimmed to the point the surgeon is satisfied with its diameter, but this approach may reduce the usable length of the BBVF. Future work to our opinion should also focus on techniques to improve further staged procedures , firstly by studying interval Duplex scanning to guide the surgical technique and minimize the interval to the second stage by performing this once the basilic vein is sufficiently enlarged and secondly by comparing elevation with formal transposition. Nevertheless, the results of our meta-analysis imply that BBVF procedure staging should be considered, after discussing its indications, benefits and disadvantages with the patients and referring nephrologists. In conclusion, among candidates for BBVF fistula, there is high quality evidence to suggest that two-stage BBVF achieves higher maturation rates compared to one-stage BBVF. However the difference in long-term secondary patency is less evident, calling for further research. Fig. 1. 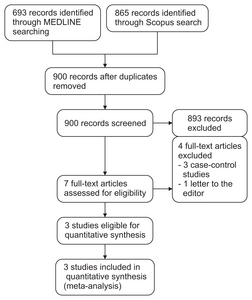 PRISMA flow diagram showing the selection process of suitable randomized controlled trials for meta-analysis. Fig. 2. (A) Risk of bias graph and (B) summary demonstrating a low risk of bias in most attributes. Risk was high for performance bias of these surgery trials. Fig. 3. (A) Two-stage brachio-basilic vein fistulas (BBVFs) achieved better early results (reduced maturation failures) and (B) long-term functional secondary patency (reduced abandonment rates) (C) compared to one-stage BBFV, however, long-term failure of one-stage BBVFs was similar with two-stage BBVFs after excluding early/maturation failures. RR, risk ratio; M-H, Mantel-Haenszel; CI, confidence interval; df, degrees of freedom. Fig. 4. Results of sensitivity analysis are shown in this figure. (A) Maturation failure of one-stage brachio-basilic vein fistulas (BBVFs) was significantly worse compared to two-stage BBVFs and (B) similarly two-stage BBVFs were less likely than one-stage BBVFs to lose their functional secondary patency. (C) Long-term complications (excluding postoperative events) showed a non significant trend to occur more often with one-stage BBVFs than two-stage BBVFs, (D) however all complications were significantly more likely to occur with one-stage BBVFs compared to two-stage BBVFs. RR, risk ratio; M-H, Mantel-Haenszel; CI, confidence interval; df, degrees of freedom. El Mallah, 1998  Transposition (n=20) Elevation, with flap use (n=20) Mean age 34.2 years, male/female ratio 27/43, mean number of previous ipsilateral (wrist) and all AVFs 1 and 2, respectively, mean follow-up 15.4 months Improved early and late patency in two-stage BBVFs. Hossny, 2003  Transposition (n=30) or elevation (n=20) Elevation (n=20) Mean age 49 years, male/female ratio 23/17, mean number of previous AVFs 2, mean follow-up 25.7 months Procedure staging had no effect on patency rates. Superficialization (elevation) was associated with worse patency, but the results were not statistically different from transposition procedures. Kakkos, 2015  Transposition (n=9) Transposition (n=7) Mean age 60.1 years, male/female ratio 7/9, mean number of previous ipsilateral and all AVFs 0.5 and 0.75, respectively, mean follow-up 14.3 months. Duplex was used to select candidates with a non-enlarged basilic vein. Improved early (significant) and late patency (trend) in staged procedures. BBVF, brachio-basilic vein fistula; AVF, arteriovenous fistula. N/A, not available. A fixed effect model was used if not otherwise stated. The corresponding risk (and its 95% confidence interval [CI]) is based on the assumed risk in the comparison group and the relative effect of the intervention (and its 95% CI). Patient or population: Chronic kidney disease. Settings: brachio-basilic vein fistula (BBVF) surgery. Intervention: Two-stage BBVF. Comparison: One-stage BBVF. Grading of Recommendation, Assessment, Development and Evaluation (GRADE) working group grades of evidence. High quality: Further research is very unlikely to change our confidence in the estimate of effect. Moderate quality: Further research is likely to have an important impact on our confidence in the estimate of effect and may change the estimate. Low quality: Further research is very likely to have an important impact on our confidence in the estimate of effect and is likely to change the estimate. Very low quality: We are very uncertain about the estimate. Some bias is present; although unlikely to change the effect size, a conservative approach was opted and quality of evidence is downgraded. Upgraded because of a large magnitude of effect. Upgraded because of the presence of a plausible confounding variable that would change the magnitude of effect (two-stage BBVF procedures were more often elevations than one-stage BBVF procedures, leading to a reduced effect size; elevated BBVFs may have worse outcome than transposed BBVFs because cannulation may be hindered by the overlying scar). Downgraded due to impression (total cumulative sample size is lower than the calculated optimal information size). Downgraded due to impression (95% CI around the pooled estimate of effect includes both 1) no effect and 2) appreciable benefit or appreciable harm). Downgraded due to inconsistency (significant heterogeneity was present). Upgraded because sensitivity analysis removed heterogeneity. Dagher, FJ, Gelber, RL, Ramos, EJ, and Sadler, JH (1976). Basilic vein to brachial arter y f istula: a new access for chronic hemodialysis. South Med J. 69, 1438-1440. Lok, CE, Sontrop, JM, Tomlinson, G, Rajan, D, Cattral, M, and Oreopoulos, G (2013). Cumulative patency of contemporary fistulas versus grafts (2000–2010). Clin J Am Soc Nephrol. 8, 810-818. Davis, JB, Howell, CG, and Humphries, AL (1986). Hemodialysis access: elevated basilic vein arteriovenous fistula. J Pediatr Surg. 21, 1182-1183. Meria, P, Cussenot, O, Stolba, J, Raynaud, F, and Bourquelot, P (1995). Création des abords vasculaires pour hémodialyse. Tech Chir-Urol. 41, 12. Zielinski, CM, Mittal, SK, Anderson, P, Cummings, J, Fenton, S, and Reiland-Smith, J (2001). Delayed superficialization of brachiobasilic fistula: technique and initial experience. Arch Surg. 136, 929-932. El Mallah, S (1998). Staged basilic vein transposition for dialysis angioaccess. Int Angiol. 17, 65-68. Kakkos, SK, Tsolakis, IA, Papadoulas, SI, Lampropoulos, GC, Papachristou, EE, and Christeas, NC (2015). Randomized controlled trial comparing primary and staged basilic vein transposition. Front Surg. 2, 14. Kakkos, SK, Haddad, GK, Weaver, MR, Haddad, RK, and Scully, MM (2010). Basilic vein transposition: what is the optimal technique?. Eur J Vasc Endovasc Surg. 39, 612-619. Vrakas, G, Defigueiredo, F, Turner, S, Jones, C, Taylor, J, and Calder, F (2013). A comparison of the outcomes of one-stage and two-stage brachiobasilic arteriovenous fistulas. J Vasc Surg. 58, 1300-1304. Hossny, A (2003). Brachiobasilic arteriovenous fistula: different surgical techniques and their effects on fistula patency and dialysis-related complications. J Vasc Surg. 37, 821-826. Ozcan, S, Gur, AK, Yener, AU, and Odabasi, D (2013). Comparison of one- and two-stage basilic vein transposition for arteriovenous fistula formation in haemodialysis patients: preliminary results. Cardiovasc J Afr. 24, 364-368. Agarwal, A, Mantell, M, Cohen, R, Yan, Y, Trerotola, S, and Clark, TW (2014). Outcomes of single-stage compared to two-stage basilic vein transposition fistulae. Semin Dial. 27, 298-302. Robertson, BF, Robertson, GA, Khan, L, and Raza, Z (2013). Brachiobasilic fistula formation - single versus two stage procedure. Eur J Vasc Endovasc Surg. 45, 689-692. Yammine, K, and Eric, M (2017). Patterns of the superficial veins of the cubital fossa: a meta-analysis. Phlebology. 32, 403-414.
del Sol, M, Lillo, E, Lobos, L, and Vasquez, B (2012). Study of the veins of the cubital fossa by helical computed tomography and its clinical application. INT J MORPHOL. 30, 64-69. Lee, H, Lee, SH, Kim, SJ, Choi, WI, Lee, JH, and Choi, IJ (2015). Variations of the cubital superficial vein investigated by using the intravenous illuminator. Anat Cell Biol. 48, 62-65. Francis, DM, Lu, Y, Robertson, AJ, Millar, RJ, and Amy, J (2007). Two-stage brachiobasilic arteriovenous fistula for chronic haemodialysis access. ANZ J Surg. 77, 150-155.
Cooper, J, Power, AH, DeRose, G, Forbes, TL, and Dubois, L (2015). Similar failure and patency rates when comparing one- and two-stage basilic vein transposition. J Vasc Surg. 61, 809-816. Ryden, L, Grant, PJ, Anker, SD, Berne, C, Cosentino, F, and Danchin, N (2013). ESC guidelines on diabetes, pre-diabetes, and cardiovascular diseases developed in collaboration with the EASD. Eur Heart J. 34, 3035-3087. Kakkos, SK, Haddad, GK, Haddad, RK, and Scully, MM (2008). Effectiveness of a new tunneled catheter in preventing catheter malfunction: a comparative study. J Vasc Interv Radiol. 19, 1018-1026. Kakkos, SK, Topalidis, D, Haddad, R, Haddad, GK, and Shepard, AD (2011). Long-term complication and patency rates of vectra and IMPRA carboflo vascular access grafts with aggressive monitoring, surveillance and endovascular management. Vascular. 19, 21-28. Akoh, JA, and Paraskeva, PP (2015). Review of transposed basilic vein access for hemodialysis. J Vasc Access. 16, 356-363. Bashar, K, Healy, DA, Elsheikh, S, Browne, LD, Walsh, MT, and Clarke-Moloney, M (2015). One-stage vs. two-stage brachio-basilic arteriovenous fistula for dialysis access: a systematic review and a meta-analysis. PLoS One. 10, e0120154. Paulson, KA, Gordon, V, Flynn, L, and Lorelli, D (2011). Modified two-stage basilic vein transposition for hemodialysis access. Am J Surg. 202, 184-187.